SPECIAL: Here's your chance to live on Lake Avenue! 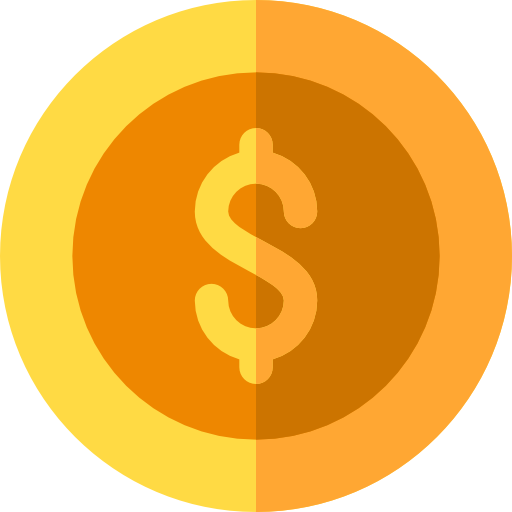 Save up to $300 for moving expenses when you apply today! 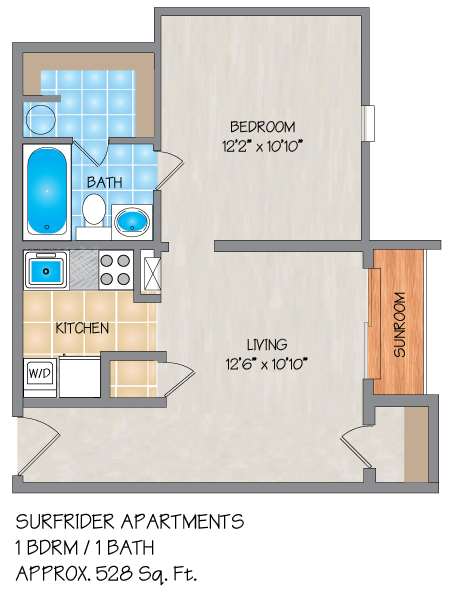 Please send me more information about Surf Rider Apartments. 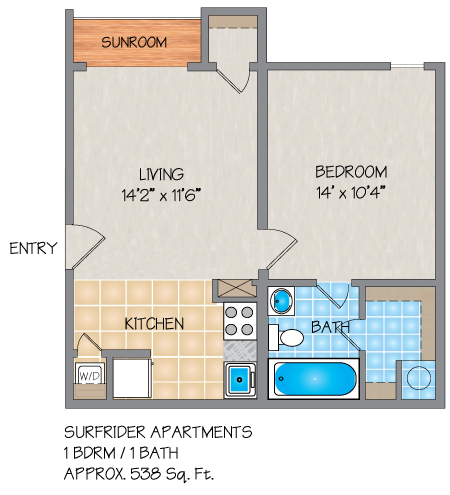 At Surf Rider, a Metairie, LA apartment community, you will have several different floor plans to choose from to rent, every single one offering an abundance of closet space, and a fully equipped kitchen. Choice apartments offer vaulted ceilings with a skylight. Surf Rider also features select homes which have been completely renovated. 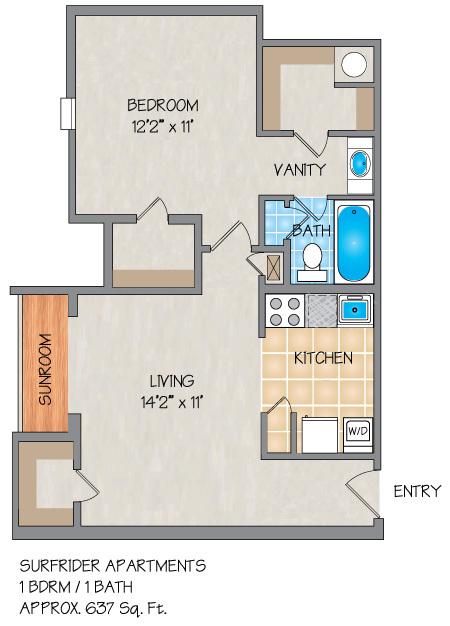 These particular apartments have new appliances, cabinets, fixtures and more. The property of apartments in Metairie, LA surrounds a nicely landscaped courtyard with a sparkling pool, lounge chairs and patio furniture. This is a small community boasting a great location. Only minutes from downtown New Orleans, local seafood restaurants, shopping, lake activities, levee jogging and more. Apartment homes that offer nothing but the best, the best location, the best apartments: you will get it all and more at Surf Rider Apartment Homes. If you are looking for an apartment for rent in Metairie, come see for yourself. Surfrider This apartment complex is in a great location, near veterans, Lakeside mall and lots of restaurants. The location can't be beaten, it is at a walking distance from the lake running trail and delicious restaurants like New Orleans Food and spirits and Deanies. Its in the heart of Bucktown. The neighborhood is very nice. The apartment complex is very well maintained, landscaping is a big thing, lots of trees. If you have any maintenance issues, you can place maintenance requests online and they are always taken care off in a timely manner. The apartments are a little bit small, but in my opinion they are the right size, not extremely big and not super small. I love the big bathroom closet and the bedroom size. I would like the kitchen to be a little bit bigger, not enough counterspace and doesn't have a pantry. I love having my own washer and dryer in the apartment, you dont have to be walking around with your clothes basket. The sunroom is one of my favorite areas of my apartment, Ive made it my own retreat, I have a great view of the pool outside and big windows. The staff is very nice and helpful. Overall it has been a great experience. I've lived at Surf Rider for two and a half years now and I couldn't be happier with the apartment complex or management. It is a very safe and quiet place and just a short drive away from numerous restaurants, bars, shopping locations(including Lakeside Mall, grocery stores, gas stations, and the beautiful Lake Pontchartrain. The staff and maintenance crew are excellent-very friendly and on top of things. I enjoy living at Surfrider Apartments. The most important thing for me as that I feel safe living there with my family, especially since I did not feel safe at the apartment complex where I lived prior. The place is cozy and everyone I've dealt with has been very nice. We also have a nice large pool in the center of the property that's great for swimming in the summer months. My name is Paige Henderson and I have lived at Surf Rider for about a year now and i LOVE it!! It's a super quiet and safe neighborhood, with a gas station and some good local restaurants right down the street. Also, when my washer machine stopped working, maintenance was there the next morning and fixed it within 30 minutes. The pool is ALWAYS spotless. All of my neighbors are friendly, including the office staff. I plan on living here for a long time! I have been a happy resident of surf rider apartments for the past 3 years. It's located in an excellent location with many amenities within a 5 minute car drive. It's the perfect spot to be where you can go out downtown when you like yet you don't have to deal with the hustle and bustle of city life ie parking, traffic etc.. The staff and maintenance are extremely helpful in resolving any issues that may arise. The apartments are quaint, clean, and just what I was looking for. I would recommend these apartments to any students or recent grads. I have been a resident of Surf Rider for two and a half years now. It has been a wonderful experience. It is quiet and safe, with gates to get into the apartment complex, but none to get into and out of the parking lot, which is nice because it is quick and easy to drive in and out. Best part in my opinion is the competence of the staff and maintenance crew...very friendly and on top of things. My name is Justin Celestin and I love it here. When my air conditioning went out they fixed it immediately and have always been quick to respond to any of my needs and tentative. I feel safe with a personal gated entrance and the property is always well maintained and clean. My name is Justin Celestin and I live in Surf Rider Apt and I really really like it. If anything breaks they respond very quickly. It is quiet, safe and the grounds are well maintained. They allow small pets and provide a washer and dryer in every unit. Close to lots of cool restaurants and the lake. The main thing for me is the location. It's in a great area and I feel safe. I'm also close to work, so it's very convenient. There's always ample parking, even if I come home late. 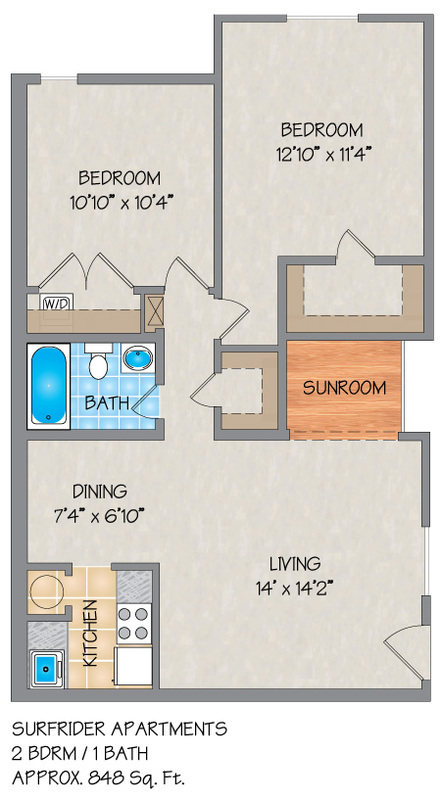 I love the sun room and the walk-in closet in the bedroom, although the kitchen is a little small. One of the best things is that you can get coupons for discounts from local businesses just by living there. Also, the staff is very friendly and knowledgeable. Water, gas and trash are included in the rent. Love the location. Staff is very friendly and cares about the residents. Not having to deal with a laundry facility is terrific... I just love having a washer and dryer in my apartment.